Ofcom continues to keep an eye on the state of the UK broadband market. This morning it has put out a news release with a few surprising claims about the state of play, and announced a range of measures to help make things better. Commenting on the current broadband market, Ofcom claims that millions of customers in the UK could get faster broadband without paying any more than they do currently. It says that even though 94 per cent of UK homes and offices can now get superfast broadband, less than half have taken it up. This is despite the fact that switching to superfast may cost the same, or less, than they currently pay. From 2019 broadband companies – as well as mobile, landline and pay-TV providers – will have to tell customers about their best available deal, both when their deals are coming to an end, and every year after that if they don’t change their deal. Ofcom is going to look closer at broadband pricing practices. It wants to know why some pay more than others for the same service - especially the vulnerable. 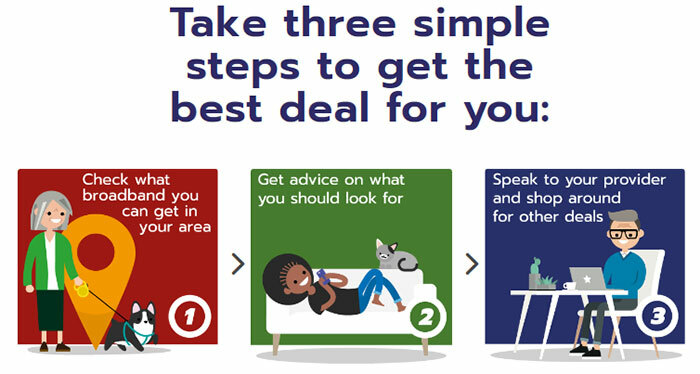 A major information campaign called 'Boost your Broadband' is launched today with an accompanying website which highlights the broadband available in your postcode area and the daily best deals. 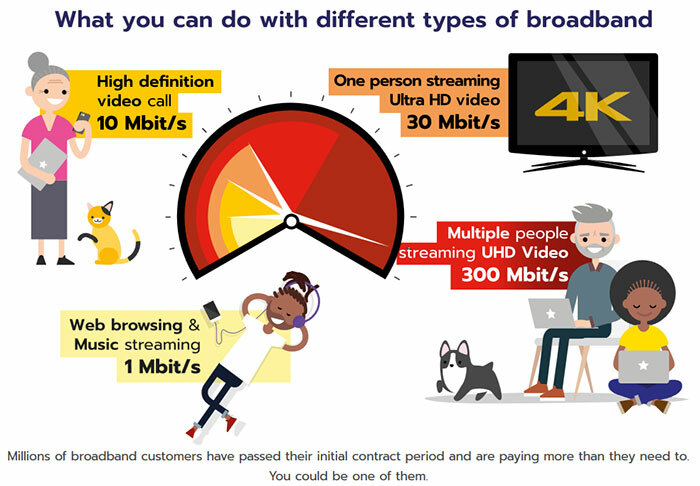 Expect to hear more from your broadband company next year as point 1, above, comes into play. When any provider has a better deal or tariff than what you currently have they must alert you. Furthermore, when a discounted deal you might be on is coming to an end, and every year for very loyal customers, you will hear from your provider about the best deals they can currently offer. Boost Your Broadband is now live. 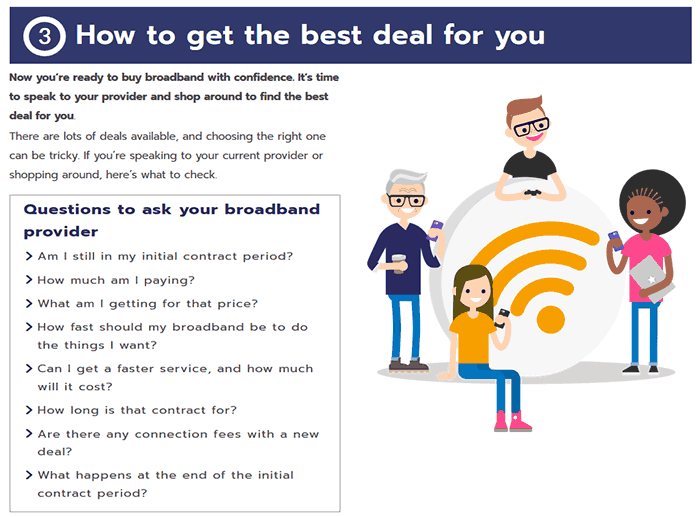 The site includes a simple step by step broadband checker which takes your postcode and tells you what is available, asks you about your needs, and then helps provide the current best deals. That last step I found to currently be a disappointing static page with a list of questions to ask your current provider (see above) and a downloadable PDF to help you decide whether to upgrade, switch or stick. I expected it to be more like one of the commercial comparison sites. Very admiral of Ofcom, what they are doing is absolutely right, but the problem is ISP's will just offset it by driving up prices for everybody in the long run once the networks become saturated with the new army of fibre users. What annoys me about internet, and this isn't entirely related but is something I've come across a couple of times recently, is people expecting fast internet, regardless of their location. I know someone who has just moved house and now they're complaining to their ISP that the internet isn't as fast as the last place. They did no prior checks what so ever. With fibre everywhere, it should be a moot point but as usual, BT are profit driven, regardless of how money the government give them to provide the infrastructure. My internet is slowing down likely due to more traffic shaping. Incredibly fast sometimes but you get to a certain peak time and certain sites slow down quite a lot. I'm not sure if its BT wholesale doing it or Plusnet or both. If it's the former then I'm assuming changing ISP won't help as it's beyond their control. That's not entirely true. Some ISP offer to put your connection in a priority list that just bypasses traffic shaping, up to some extent.